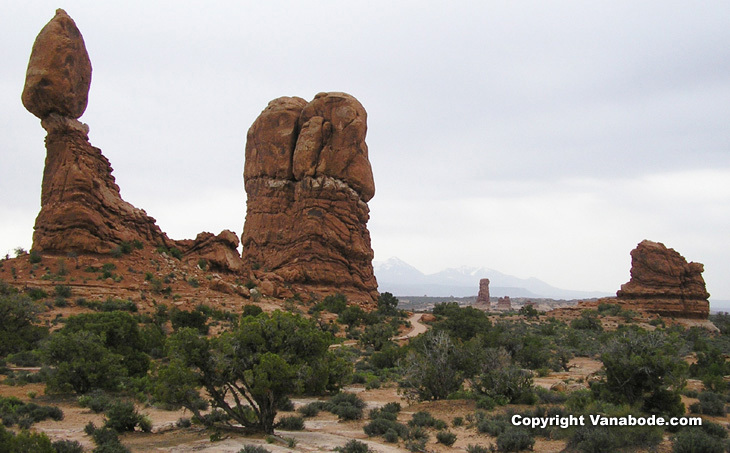 Arches National Park Utah - see Visitor Center for free maps and information. From your vehicle you can see arches near and far, spires, balancing rocks, and the snow capped La Sal Mountains in the distance. The scenic drive is 40 miles round trip with numerous parking areas for scenic overlooks and trail access and is absolutely one of the best scenic drives I have ever been on. The easy access, great climate, clear dry high desert air and sunny days almost every day makes for easy photography that nearly all ends up a keeper. 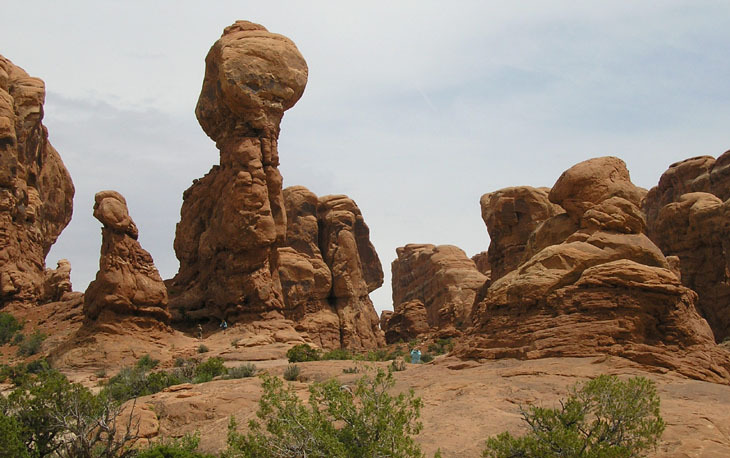 Arches has over 2,000 natural arches, balancing rocks, spires, pinnacles as well as hoodoos and some of the most far out geological formations imaginable. This place is a real treat and easy to do on a Vanabode trip except in the hottest summer months. Don't forget you can purchase a national park pass for one year and gain unlimited access to all national parks for free for the rest of the year. Park Avenue to Landscape Arch to Devils Garden campground, it has the most incredible natural arches and massive rock sculptures I have ever seen. In fact I was stunned and could not speak for much of the day because words are nearly useless in pointing out the features of Arches. As soon as you start ascending on the winding scenic road from the visitor's center your eyes can't help but look left to right to left to right. It's crazy how childlike I am every time I visit a national park, even if it is one I have been to a few times. I am so impressed and overwhelmed with not only God's creations but the heart of the people who knew that preserving such wonders was vital and of course still is. Van camping this area is far superior to any other method. From your car you can see the 12,721 feet high snow capped La Sal Mountains in the distance which span a distance of about 18 miles. 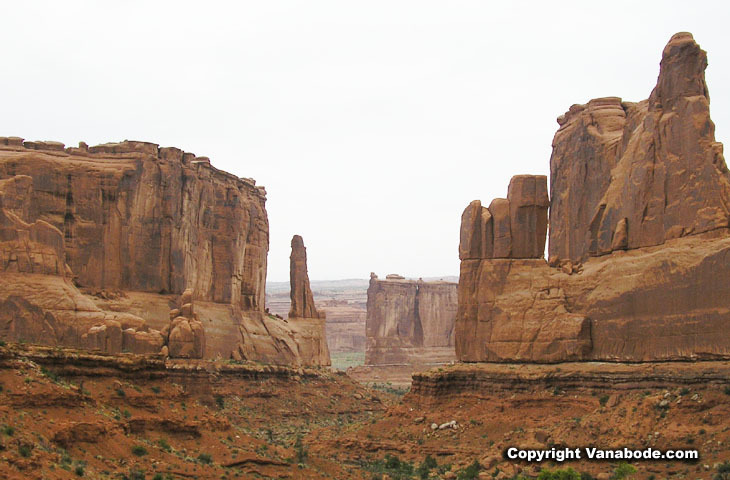 This makes for a beautiful backdrop for your pictures from Arches National Park. I was excited to be able to see arches from our van while driving through the park. I was expecting that to see any arches I would have to hike out at least a couple of miles one way, but was I pleasantly surprised. Not that I don't like hiking or getting deep into any national park. If you have read any of our other pages on our travels you will see that I basically can't sit still outside of a movie theater that is. 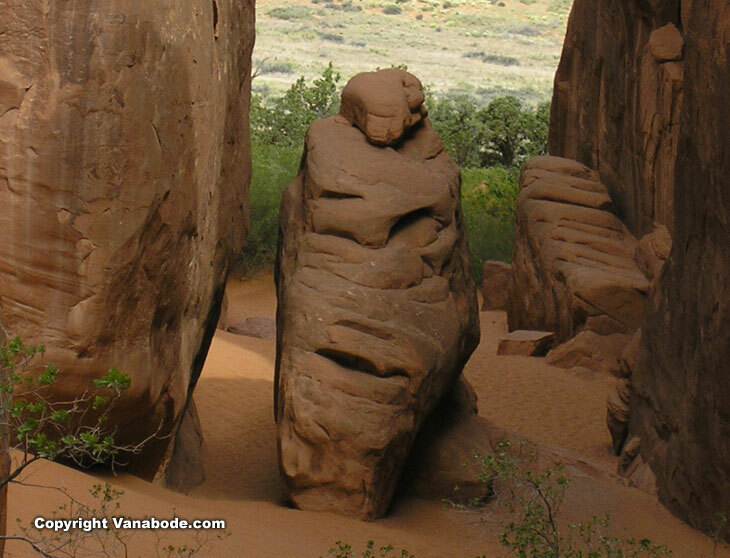 And to really feel the scale of these magnificent features you should hike as many trails as you can to get up close and personal with every feature Arches National Park is famous for. Above: Picture taken at Sand Dune Arch. From the parking lot this was a very short walk to view this area. This was a great little place to climb on some smaller rocks and get a break from the sun in it's many shady areas. The underground salt bed that Arches sits on is basically responsible for the formations so typical at this sightseer's mecca. Entrada Sandstone is the basic material of the arches which is a blend of numerous textures and densities fused together with varying amounts of calcium carbonate cement. And combined with the rain and ice a variety of erosion effects of fins, arches, and sculpted rock are formed. Arches has about 2,000 natural arches, balancing rocks, spires, pinnacles as well as hoodoos just like Bryce Canyon National Park. Arches National Park covers about 73,000 acres. The scenic drive is 40 miles round trip with numerous parking areas for scenic overlooks and trail access and is absolutely one of the best scenic drives I have ever been on rivaling even the California coast. 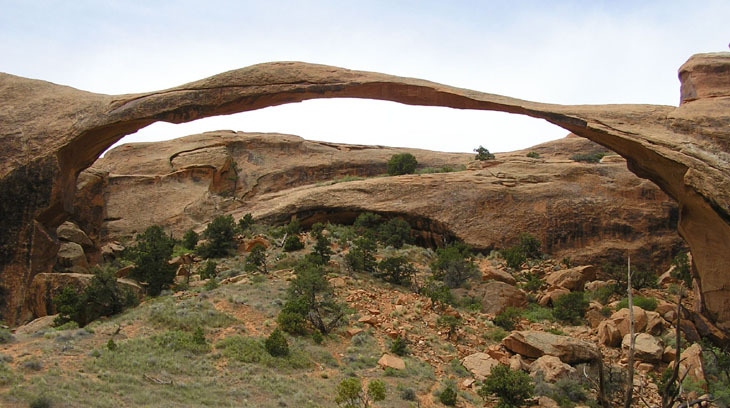 Above: Landscape Arch is one of the favorites to see while at Arches National Park. It is the longest arch in the park measuring 306 feet. If Arches is on your Bucket List then I suggest getting there as soon as possible because these arches are continuously crumbling. Do you see the really thin part of the arch, to the right of the middle? Well a massive slab of rock fell from the underside in 1991. Arches is far from light pollution and the altitude and dry air gives it a wonderful place to star gaze and see our solar system's Milky Way. Bryce Canyon as well as many other southern Utah national parks are also known as a star gazer's paradise. Take food with you into the park because within the boundaries of Arches there are no stores, gas stations or lodging accommodations. However, there is the 52-site Devils Garden Campground but it has no hookups or a dump station. It is at the end of the 18 mile scenic drive. Because of the limited first-come first-served sites it is imperative you pre-register at the visitor's center first thing in the morning. Above: The Park Avenue Courthouse spectacle is the first major stopping point on the drive through Arches coming from the visitor's center. There is also a trailhead from the the viewpoint that is only two miles roundtrip to the bottom of the canyon. As with all national parks you can take advantage of ranger-led programs and the campground has nightly campfire talks. Of course there are some great hikes which allow for you to have fun with one-of-a-kind photo opportunities with your friends and family. Arches as well as Zion, Glacier, Sequoia and Kings Canyon National Parks are terrific backdrops for some family photos. 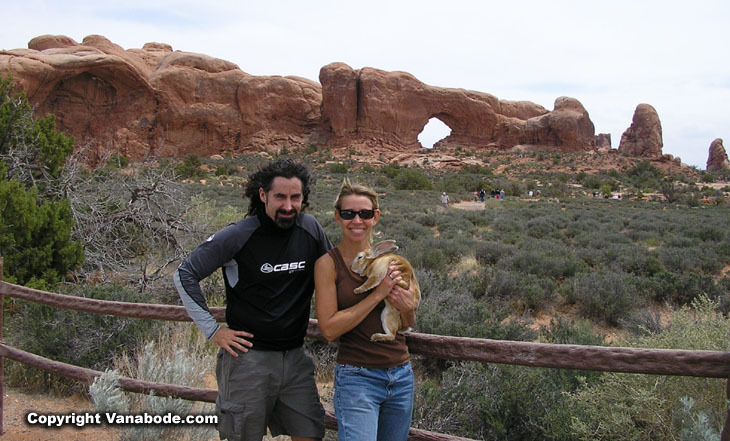 Out of the 14 hikes in the Arches Visitor Guide, nine of them will take you anywhere from 15 to 60 minutes to complete. That leaves you with no excuses to take a walk, not really a hike. These are maintained paths that are used over and over every single day of the year. Above: Windows Arches is a sandstone rock with dozens and probably hundreds of little to large arches cut into it. Just from the parking lot you can see dozens of window arches scattered in the rock. With these shorter hikes there is no need to take a heavy backpack with food and such because you will be back at your car within an hour. But you will definitely need to take water no matter what time of year you visit the park. 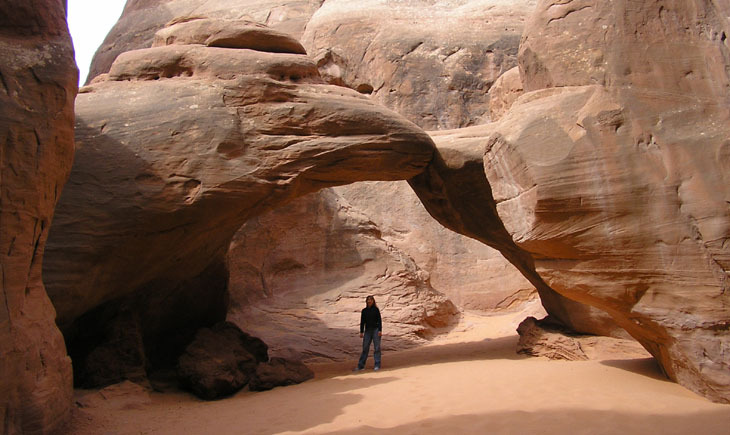 Arches is in a high desert region which translates to lack of humidity. In other words, your sweat will evaporate so quickly unless you are already familiar with desert living you might not think you are losing any water from your body. Above: There are as many pinnacles in the park as there are arches, and all are captivating. Jason's thoughts - I cannot emphasize enough GET HERE! You will not be disappointed. Stunning, beautiful, massive take your breath away hiking, site seeing, and mind altering beauty. You will never be the same. Remember our pictures do NOT do Arches justice. You have to see them for yourself. Plus they are only 5 hours from the greatest city in the world Las Vegas where they offer tour bus trips from the strip to these national parks. Kelly's thoughts - I was excited from the moment we left the visitor's center. The canyon walls of Park Avenue are so massive that I felt like a tiny ant along the trail. Every stop throughout the park was unique especially with the snow capped La Sal Mountains in the distance. I can't believe that with all the trips we have made to the west that this was our first time to Arches. Shame on us. 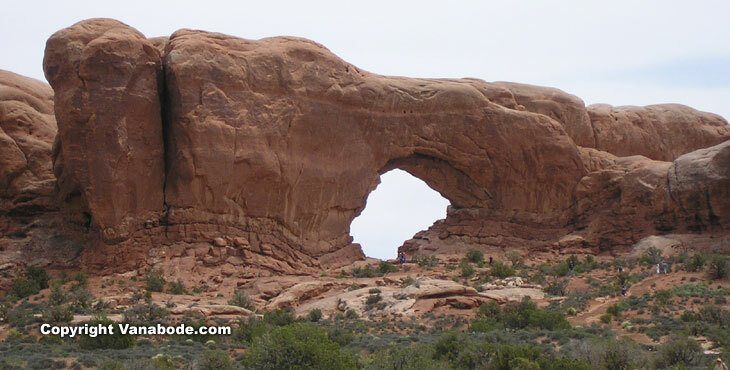 Travel info - Arches National Park is just south of I-70 near the Utah and Colorado border. Moab is only five miles from the park for those wanting the famous bike rides. 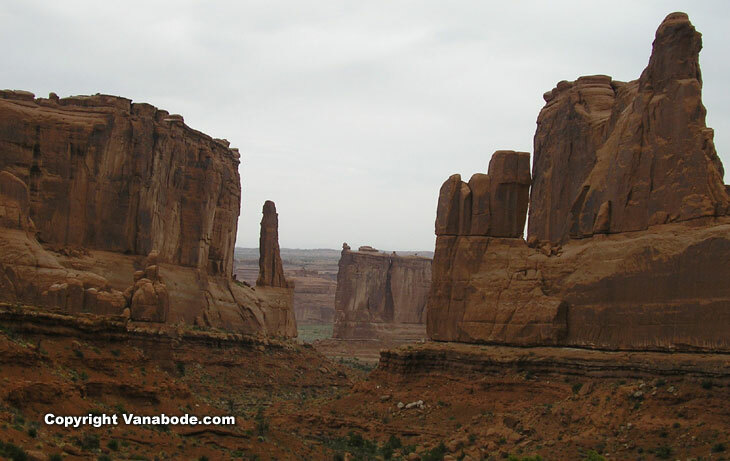 Travel 5 miles north from Moab to visit Arches National Park. Additional information on Bryce Canyon National Park and Capitol Reef National Park in Utah. Click for unforgettable pictures and experiences on this affordable 10,524 mile 17 week trip.